When the kids at Once Over Coffee Bar decided to throw their hat in Austin’s ultra-crowded, semi-competitive coffee ring it could have been described as a long shot. But they had an ace in the hole: Artisan coffee served by professional baristas who are practicing a craft-not working a job til their indie rock band gets signed. Realistically there are only three joints that could be described as serving craft coffee in Austin. Out of a hundred or so coffee shops in town there’s still plenty room at the top. JP’s Java, on a good day, can serve you an estimable cup. Get the right barista, in the right mood and you can have a superior pull at Caffe Medici. Sure there are dozens of baristas around town for whom intransigence is a lifestyle but they’re not professionals practicing a craft. They’re just plain old stuck. The mad scientist style coffee that you can get in a few places on the West coast has largely gone unserved in Austin. When was the last time you saw your barista, jaw clenched in concentration,tweaking the knobs on his espresso machine like life itself hung in the balance? When was the last time you asked for a glass of ice and the barista SPRINTED to the ice machine, stopped on a dime then heaved himself back in your general direction with a smile and a cup of ice? I drink a lot of coffee. I drink it at about 10 regular places in town as I make my daily rounds.North, East, Central, South…I got my spots and they’re usually based on a bunch of factors that have little to do with the quality of the bean. But when it’s paramount that I have a delicious perfect pull where all the countless factors are taken in account then for me there’s really only one cafe: Once Over Coffee Bar. Latte’s terrify me. Why anyone would want to spoil a delicious cup of coffee with milk [in itself delicious, just not with coffee] is beyond me. If I think the barista knows what he’s doing I’ll always get a double Americano. If I have my doubts [which is 90% of the time] I’ll get a small light roast. The Americano at Once Over Coffee Bar is divine. This is where I take my friends who like to sit around and talk endlessly about the variables that go into a good cup. Kind of like El Taco Rico, it’s where you take your friends who actually know how good Mexican food can be in the hands of a skilled cocinera. The last couple times I tried to park in Once Over Coffee Bar’s parking lot it was flat sold out. I hiked a short distance and refrained from the urge to start cracking heads on the people in the line inside making me wait for my coffee. 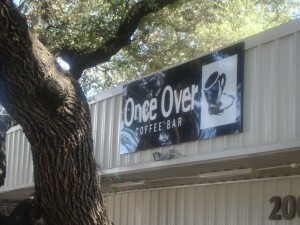 This entry was posted in Austin Texas and tagged 78704, Austin, bouldin creek coffee, coffee, once over coffee bar, south austin, texas. Bookmark the permalink. But they came to the party. It’s a year and a half after I wrote this article and I still stand by it.